No products in your bag. Inspired by her recent residency in India, Sarah Perkins copper bowls amaze the viewer with superb forms, brilliant colors and stylistic surprises like stitched seams, gemstones, and unusual textures. 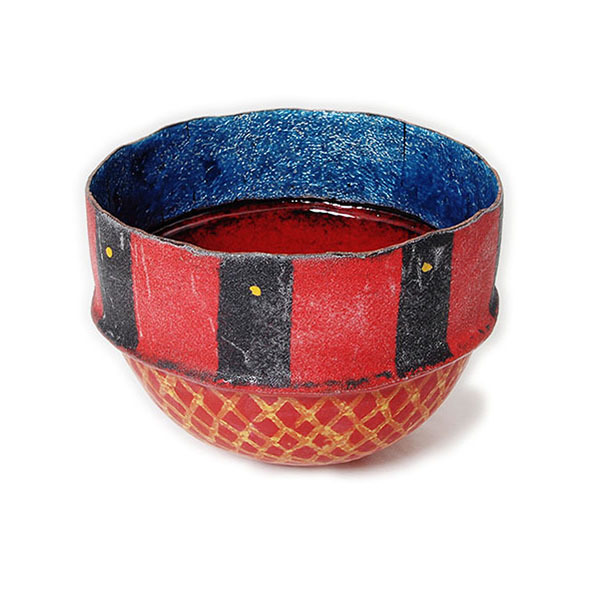 Dehli Stripes Bowl, Red is a beautifully emotive vessel, decorated with thick stripes of black enamel around the rim and patterned with gold over vibrant red at the base. The interior glows a textured blue with deep, glossy red beneath, one of the most difficult colors of enamel to achieve.